How Many Roster Battles Remain for the Birds? With the Eagles breaking camp on Tuesday, the countdown begins in earnest to the start of the season. I was going to take this opportunity to take stock of the latest depth chart battles. However, glancing over the Eagles roster today, I don’t see many competitions left, and those that remain are for the final few spots. Let’s run through the positions. Quarterback: The namesakes have departed, leaving Vick, Young, And Kafka. No drama here. Running Back: Owen Schmitt has gotten no real competition for the lone fullback spot. Supposedly there’s a competition underway for the 3rd RB, but I’d be surprised if fifth round pick Dion Lewis didn’t win that job. Tight End: Anyone who tells you Green Bay castoff Donald Lee is going to make the team, barring unforeseen injury, is crazy. Wide Receiver: If Steve Smith really comes off the PUP list before the season starts, Chad Hall is the only guy the team might stretch to keep. Offensive Line: Lots of dead weight here I wouldn’t mind showing the door. McGlynn and either Austin Howard or King Dunlap will be gone, along with the rest of the camp bodies. Defensive Line: The tackles are a mess due to injuries, but at the end of the day it comes down to Laws or Hargrove. Defensive end is just a matter of keeping CFL star Philip Hunt or not. Linebackers: I actually still think a veteran backup middle linebacker makes sense here. Both Greg Lloyd and Brian Rolle can probably be stashed on the practice squad. Cornerback: If the Eagles still have high hopes for both Hughes and Lindley, they will find a suitor for Hanson. Safety: Allen, Coleman, Jarrett compete for starting jobs. Colt Anderson makes the team as special teams maven. Special Teams: Hope you like rookies. 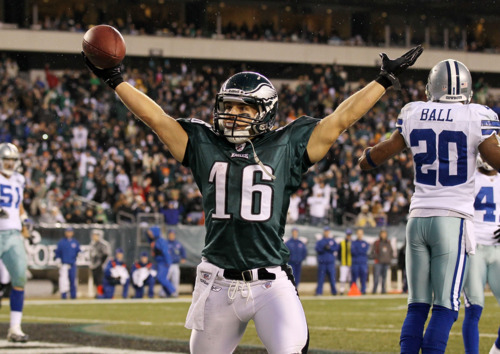 The Eagles free agent binge has filled in a lot of spots we thought might have been contested. There will probably be a good deal of talk about the final roster, but about 90% of it already looks complete. Tagged with Philadelphia Eagles, NFL, Training Camp, Offseason, Competition, Roster, Philip Hunt, Chad Hall, Dion Lewis, Brian Rolle, Brandon Hughes, Trevard Lindley, Rookies, Starters. August 17, 2011 by Brian Solomon.